Silver and blue enamel Maltese cross with silver flames between the arms, with crossed Roman swords above, on laterally-pierced ball and ring for ribbon suspension with silver purity marks and JL maker's mark for Jacob Leser of Straubing; the face with a circular central deep blue enamel medallion bearing the silver-gilt crowned cipher of King Ludwig III within a circular border in the form of a white enamel buckled belt inscribed in gilt letters ‘MERENTI’ (Latin = Merit) above, with gilt arabesques below; the reverse with a circular central deep blue enamel medallion bearing the silver-gilt Bavarian crowned lion rampant within a circular border in the form of a buckled belt dated ‘1866’ in gilt numerals above, with gilt arabesques below; on probably replaced correct ribbon for wartime service for middle and lower ranking military officials and auxiliary services. The Order was instituted by King Ludwig III on 19 July 1866 for officers and senior officials to reward bravery and military merit. 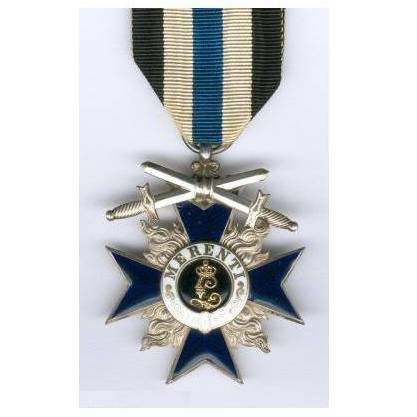 The fourth-class cross was introduced in 1905 with or without swords and with or without crown, swords denoting a wartime award and a crown denoting a second award of the Cross or especial merit.